AUGUSTA, Ga. – Georgia Regents University’s Alumni Weekend, A Celebration of our Alumni – Past, Present and Future, is slated for April 26-28. The weekend is the university’s largest alumni event and will be presented by Health Center Credit Union. It will feature campus tours, individual college banquets and class reunions, as well as several prominent guest speakers. Highlights include a guest lecture by Dr. Delos M. Cosgrove, President and Chief Executive Officer of Cleveland Clinic at 3 p.m. Friday, April 26, in the Natalie and Lansing B. Lee Auditoria Center on GRU’s Health Sciences Campus; and a cookout hosted by GRU President Ricardo Azziz and his wife Cindy at noon Saturday, April 27 at the D. Douglas Barnard Jr. Amphitheatre on the Summerville Campus. The weekend’s signature event will feature guest speaker, ABC Journalist Bob Woodruff, who was severely injured while covering the war in Iraq. He and wife, Lee, will discuss how their family survived and thrived after such a life-changing event. Their presentation is scheduled for 6 p.m. Saturday, April 27, at the Imperial Theatre, 749 Broad St. Alumni Weekend features activities for alumni of each of GRU’s nine colleges – the College of Allied Health Sciences, Pamplin College of Arts, Humanities and Social Sciences, Hull College of Business, College of Dental Medicine, College of Education, College of Graduate Studies, College of Nursing, College of Science and Mathematics and the Medical College of Georgia. 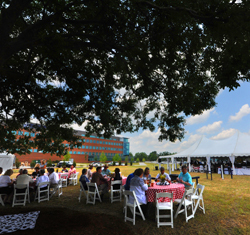 The university’s alumni award winners will also be honored during the weekend’s festivities. Other sponsors are Cudos, Regions Bank, Coca-Cola, Augusta Office Solutions, The Law Office of Stuart Oberman, RANCO and Phoenix Printing. Dr. Joseph Hobbs, Chair of the Department of Family Medicine at the Medical College of Georgia at Georgia Regents University, has been elected Secretary of the Association of Departments of Family Medicine. Hobbs will serve a two-year term as an officer of the national association. He is serving his second term on the association’s Board of Directors and has been a member since 1998. He also has served as the association’s representative to the Society of Teachers of Family Medicine’s Family Medicine Curriculum Advisory Committee. Hobbs is an MCG graduate, the college’s Senior Associate Dean for Primary Care and Community Affairs and holds the J.W. Tollison, M.D. Distinguished Chair. Last year, he was appointed to the Board of Directors of the Pisacano Leadership Foundation, the philanthropic foundation of the American Board of Family Medicine. He served as a member of the American Board of Family Medicine Board of Directors from 2003-08 and of its Executive Committee from 2006-08. He has also served as Treasurer and Chair of the Examination and Audit and Finance Committees. Hobbs received the 2010 President’s Award from the Society of Teachers of Family Medicine. Hobbs is a member of the Board of Directors of the Georgia Academy of Family Physicians Educational Foundation. He also is a member of the Board of Editors for the Health Monitor Network, which provides health maintenance and disease management and prevention information for patients. He is Project Director on three Health Resources and Services Administration/U.S. Department of Health and Human Services grants to train family medicine physicians. Georgia Regents University will celebrate Homecoming Feb. 18-23, with a week-long celebration for students and alumni. We Believe in The Jaguar Nation! is the theme of this year’s celebration, which includes a Dance Marathon and the Jaguar Jam-a tailgate and bonfire. The week will culminate with the men’s and women’s basketball games and the crowning of the Georgia Regents University Homecoming King and Queen during halftime. Activities are scheduled on the university’s Health Sciences, Forest Hills and Summerville campuses. Alumni Weekend, planned for April 26-28, will be reunion focused. More information and a schedule of events will be available in the coming weeks. All students wearing blue will receive free food and have a chance to participate in the university’s Dance Marathon Kickoff. Student organizations celebrate Homecoming by chalking designs in a square of sidewalk on either the Summerville or Health Sciences Campus. Student organizations compete in relay competitions. Students will showcase their GRU spirit by decorating tables while enjoying food and live music, followed by the lighting of a bonfire. Admission is free with the donation of two canned goods. Otherwise, entrance into the event is $5. Students will perform dances, songs or skits to their favorite music. Women’s, 1:30 p.m.; Men’s, 3:30 p.m.
Clinical use of magnetic resonance imaging, from helping diagnose degenerative spine disease to stroke, is the focus of the 2013 W.H. Pool Jr. Society Weekend March 2-3 at Georgia Regents University. 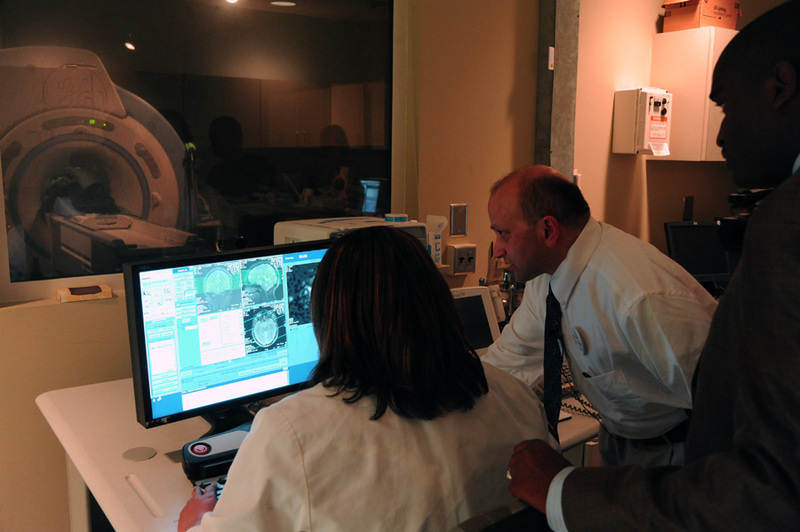 The course, which also covers the physics of MRI technology, is for diagnostic radiologists and other health care professionals interested in MRI and provides continuing medical education credit. Dr. James V. Rawson, Warren Professor and Chair of the Department of Radiology at the Medical College of Georgia at GRU, is Course Director. Lectures begin at 8 a.m. Saturday, March 2 at the GRU Alumni Center, 919 15th St. The eight-year old society honors Pool, a 1952 MCG graduate and Professor Emeritus who chaired the Department of Radiology from 1974-87. For more information, call the GRU Division of Continuing Education at 706-721-3967 or 800-221-6437 or visit http://www.georgiahealth.edu/ce/medicalce/2013/PoolSociety-March2013.html. Lectures are supported in part by the Dr. John Scott Coleman Lecture Fund and the MCG Foundation, Inc.